Three people have died, and four others have been left injured after a plane and helicopter crashed into each other near Mt Everest. Airport official Ema Nath Adhikari spoke to Straits Times, saying: "The plane slipped toward the helipad during takeoff and collided with two helicopters". The crash occurred while the Summit Air plane was trying to take off from Lukla for Kathmandu, said aviation officials. They are receiving treatment at Grande Hospital and are said to be out of danger. With the spring season tourist influx steadily increasing at the Mount Everest, many private Airline Aircraft like the ones involved in the incident, land and take off from the Lukla Airport which is touted as the 'Gateway to Mt. Everest'. 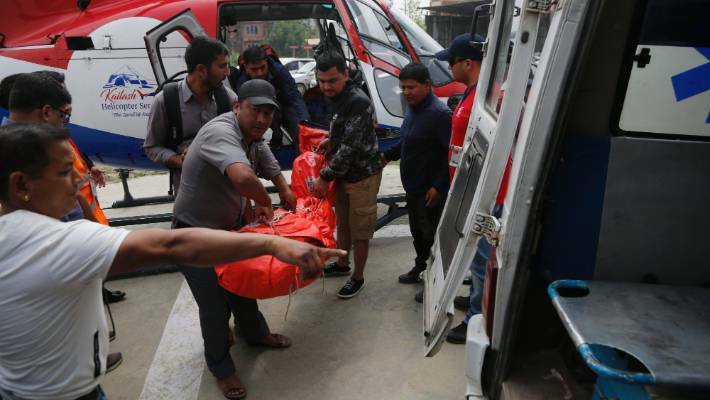 A hospital official loads a body of a plane crash victim into an ambulance outside the Teaching Hospital in Kathmandu, Nepal, Sunday, April 14, 2019. ASN also reported that both the privately owned aircraft of Summit Air and the helicopter of Manang Air were destroyed while the second private helicopter of Shree Air sustained minimal damage. The airport - called the gateway to Mount Everest - is one of the world's most risky because of the short runway and the mountainous surroundings. The Tenzing-Hillary Airport sits at an elevation of just over 9,000 feet.